Until a few months ago, I was a Mahler virgin. I had heard some of Mahler's symphonies, but I had never listened to them. With a budget set of his works courtesy of Brilliant Classics I decided that it was time to look more closely at this music which was new to me. I've long focused on early and baroque music, though I do like much music in later periods: from Schubert to Ives, from Britten to Reich, my tastes are varied. Yet the symphonic genre is something I had never really paid attention to; I usually prefer more intimate works. Armed with my set of Mahler, I started listening. And, at first, I didn't get it. I didn't get what Mahler was saying with his music, but, above all, I didn't get how he was saying it, how his intricate orchestration expressed his complex music. 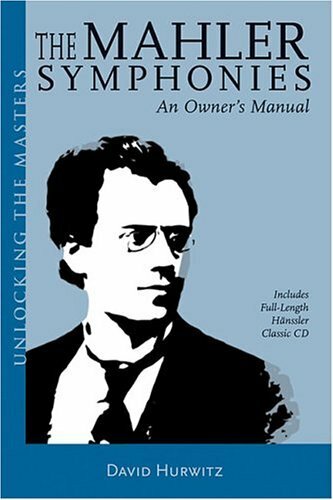 Fortunately, Dave Hurwitz's The Mahler Symphonies: An Owner's Manual was recently released, and I looked to this book for the enlightenment that I needed to understand this music. (Hurwitz is well-known in Mahler circles as an opinionated reviewer and executive editor of Classics Today (www.classicstoday.com). The approach that Hurwitz takes in this book is interesting: rather than analyze why Mahler does what he does, Hurwitz tells what happens in the symphonies. This might seem to be a bit simplistic at first glance, but when you begin reading the book as you listen to one of the symphonies, and you start noticing the motives, the different permutations of melodic material, the unique orchestrations, you realize that this is probably the best way to discover this composer whose orchestral work is quite different than most. Hurwitz points out that this is neither a "Mahler for Dummies", nor is it a "Mahler for Mahlerites"; in fact, it's a "Mahler for Beginners", for people in just the situation that I was in when I started reading the book. I was totally surprised to find that a book that simply tells me what to listen to, and when, could have such an effect on my appreciation of a composer's music. I consider myself knowledgeable about music in general, but David Hurwitz overwhelming familiarity with Mahler's symphonies, and his no-nonsense tone and approach, have allowed me to explore this relatively unique composer easily. This book has also prompted a much greater appreciation than I would probably have had if I had simply listened to the symphonies. The book also comes with a CD of four movements from different symphonies; it is both a sampler of Michael Gielen's recordings of the works for Haenssler Classics, and serves as a pedagogical support for some sections of the book, where Hurwitz's descriptions are tied to the specific timings of these movements. The only regret is that the book ignores the tenth symphony; not that I disagree with Hurwitz's choice of not discussing the completions, but he should have discussed the Adagio, which Mahler did finish, and which is a mighty deep piece of music. But all in all, this is the ideal book for a would-be Mahlerite, or for evangelical Mahlerites to give to others who they would like to convert. I�m looking forward to other volumes in the series; two other titles are currently available, about Mozart and Wagner, and I hope the publisher will continue exploring other composers.